Asian markets have begun trading again after the Chinese New Year break. Last year was a difficult year for Asia but the outlook for the Year of the Pig is decidedly different. The US Fed is becoming increasingly dovish, the US Sino trade war is de-escalating, China may announce monetary and/or fiscal stimulus at the upcoming policy meetings and there are some signs of turnaround in the technology sector in Asia (Apple supply chain, DRAM/NAND 2H recovery). Our call is that Asian markets will outperform developed markets (DM) this year. This call is a function of 4 main factors: growth, policy optionality, valuation and flows. In this wire we discuss these points and explain why we think there is a lot of ammunition on the sidelines and that an Asian market rally could become a FOMO rally very quickly. 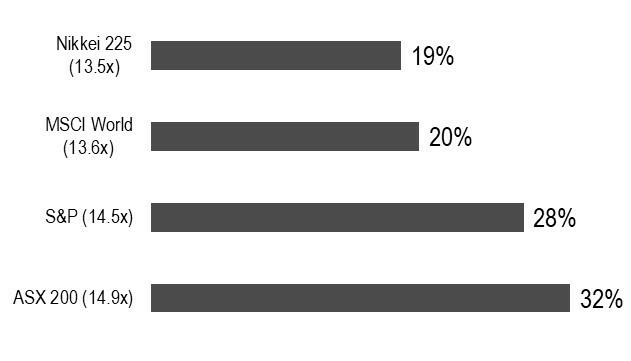 Developed markets companies are facing significant growth challenges. Let’s start with the US. Many investors have been duped into thinking that fundamental growth in the US is fantastic. However, closer analysis shows that a high proportion of stated EPS growth is a function of share buy backs (i.e. the denominator effect in EPS), onetime tax cuts and changes in accounting rules (i.e. depreciation). 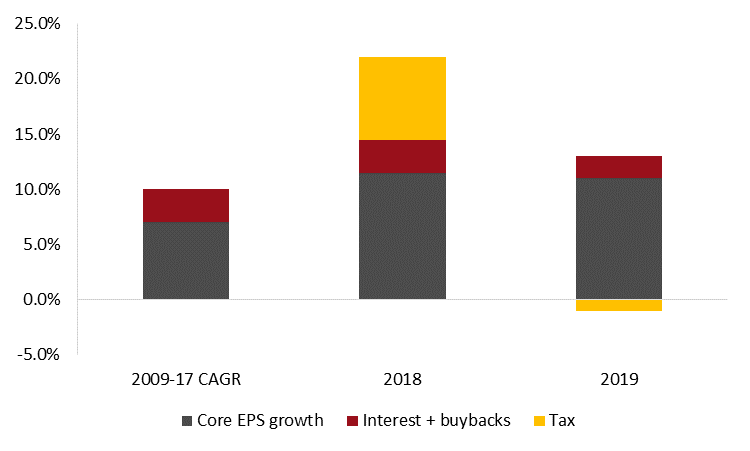 The chart below shows that in 2018, EPS growth for the S&P 500 was over 20% but almost half of that was non-core growth driven by tax cuts, interest changes and buy backs. Note that in 2019, primarily because there is no tax cut effect, S&P EPS growth falls to only 12%. In Asia on the other hand, buybacks is a very infrequently used strategy and there have been no major tax cuts, so EPS growth is almost exclusively core growth. Source: CS, BAML, Ellerston Asia and Bloomberg. For Australian investors, it is clear that the growth outlook domestically is becoming increasingly dire. On Friday the RBA finally capitulated on the economy’s growth trajectory and revised its forecast down by a surprising magnitude (from 3.25% GDP growth to 2.75%). Similarly, economies in Europe and Japan continue to be unable to generate decent levels of growth despite years of QE and unorthodox monetary policies. 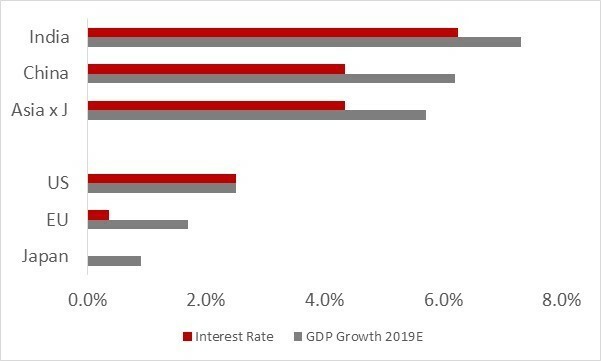 In sharp contrast to these developed market growth woes, Asian growth remains strong with GDP growth in the region expected to be approximately 5.7% in 2019. Ellerston Asia invests only in growth companies so the average EPS growth of our portfolio is very high, at approximately 19% p.a. Policy optionality is an important part of our country allocation process at Ellerston Asia. We look at the growth trajectories of each Asian country and then analyse the tool box that policy makers have available to maintain that growth. Asian tool boxes are full and policy makers have considerable optionality, while the same cannot be said for developed markets. Source: Bloomberg as of Feb 8, 2019. For example, China has multiple levers to pull to keep the growth trajectory within the target range. These levers include: monetary policy (RRR cuts, interest rate cuts, mandated loan growth, reduced pace of deleveraging), fiscal policy (tax cuts, infrastructure spend), industrial policy (China 2025, property market relaxation, supply side reform, beautiful China) and currency policy (RMB depreciation). Similarly, interest rates remain very high in absolute terms with interest rates in countries like India and Indonesia still at or above 6%. Fiscal balances are relatively healthy in the region and a number of Asian countries have elections this year (Thailand, Indonesia, India) that could usher in new, growth inducing industrial policies. The political climate makes it is much more difficult to implement step change industrial policies (Trump/Congress friction, Brexit, European Parliament elections). As shown in the table below, given the sell-off in Asian markets last year, there is now a significant valuation differential between Asian and Developed Markets. The MSCI Asia ex Japan Index is currently trading at 11.3x PE. As shown in the table below, major developed market Indices are trading at anywhere between a 19% (Japan) and 32% premium (Australia) to Asia. Emerging markets typically do not fare well in an environment characterized by rising US rates and a strengthening US Dollar (USD). 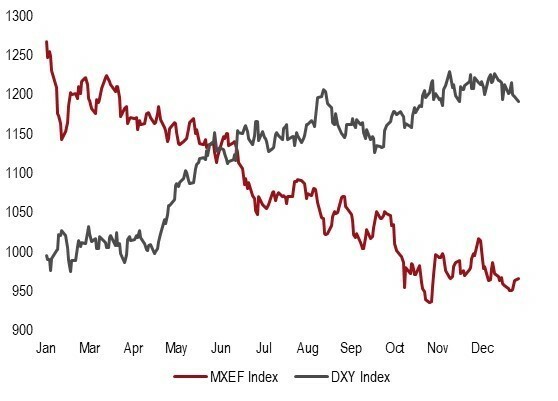 This inverse relationship was evident in 2018 with the Dollar Index (DXY) climbing and the MSCI Emerging Markets Index (MXEF) falling (see chart below). Given this relationship, there were considerable outflows from Emerging Markets in 2018. The majority of this was in fixed income and passive EM equities, while flow data indicates that dedicated, active EM and Asia managers sold stocks and went to high cash levels. As a result of this positioning, there is a lot of ammunition on the sidelines and an Asian market rally could become a FOMO rally very quickly. Asian markets (excluding Japan) are going to outperform developed markets in 2019 due to a number of factors including growth, valuation, policy optionality and flows. There are a number of catalysts that have already resulted in a turnaround in Asian equities including a more dovish Fed, a de-escalation in the trade war, Chinese stimulus and better than feared outlook for Apple and DRAM/NAND pricing. Ellerston Asia, as at 31st January 2019, is positioned for a strong recovery in Asian equities with very low cash (less than 3%), overweight positions in Asia’s two largest economies, China and India, and overweight positions in all of the mega cap Asian technology stocks (Tencent, Alibaba, Samsung and TSMC). Good luck investing in the Year of the Pig. Maybe pigs can fly? Stay up to date with the latest news on Asia from Ellerston Capital by hitting the 'follow' button below and you'll be notified every time I post a wire. Want to learn more about investing in Asia? Hit the 'contact' button to get in touch with us or visit our website for further infomation. However, China has issued more debt over the last 15 years than the entire US banking system. Will they be able to squeeze more GDP growth from what appears to be an exhausted credit engine given the implied bad debts that are already in the system and even if they can, would that not be a harbinger of even greater problems down the road? Hi Lloyd, Appreciate the question. I think the Chinese Government is very conscious not to repeat the mistakes of past easing cycles where excessive borrowing was allowed in order to stimulate economic growth. The Chinese government has worked hard over the past 3 years to clean up the financial system. Measures such as deleveraging at state-owned enterprises and local governments, reducing excess capacity in heavy industries and tightening regulations on lending practices are structural. As such, policymakers will be more cautious and selective in their stimulus actions this easing cycle. This will likely mean a greater focus on fiscal policies such as tax cuts to support domestic consumption and modest infrastructure spending along with some minor monetary easing measures such as RRR cuts. These measures should see China’s economic growth improve throughout 2019, particularly if we get a positive resolution in the US/China trade dispute.
" policy optionality " " considerable optionality " !!! Good grief Mary the jargon is over the top !! Good article though ! Hap. Bendigo . Vic. "FOMO" , not everyone has a handle on acronyms!